Simone and Jelenic subvert traditional adolescent male fantasies about the character by setting them up through Princess Diana's paramour, Steve Trevor (Nathan Fillion), and his failed attempts to seduce the avowed feminist raised outside the sphere of male-dominated sexual politics. Particularly funny is a scene in which he tries to get her drunk on tequila, and she manages to drink him under the table. Yes, this is a PG-13 cartoon. It is aimed at the same audience Warner hopes to capitalize on once they manage to get their Wonder Woman project underway after years of being stalled for one reason or another. The rating allows for some realistic violence and a darker tone that would be in keeping with the villain of the piece, the god of war. It also lures some A-list talent to contribute their voices to the project, elevating DC's direct-to-video animated fare over Marvel's. 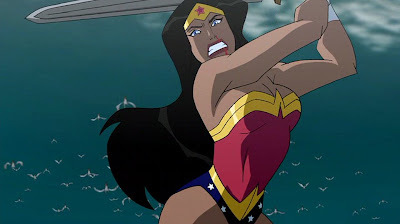 In addition to Russell, Fillion, and Molina, other actors include Virgina Madsen (Queen Hippolyta), Rosario Dawson (Artemis), David McCallum (Zeus), Oliver Platt (Hades), and Marg Helgenberger (Hera). The disc includes a first look at the next animated project they will tackle for release in July, DC's Green Lantern, which MTV recently announced is slated for a live-action debut in December 2010. From the looks of this project, fans have reason to be excited. Wonder Woman is available tomorrow on Blu-ray and Standard DVD. Still and video provided courtesy of Warner Home Entertainment.